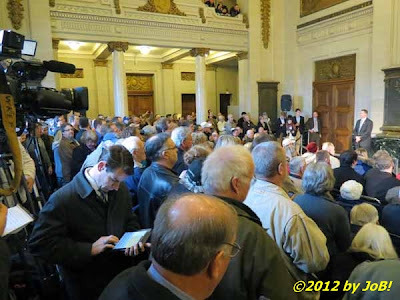 A look across a tightly packed audience in the front lobby area of Dayton's Memorial Hall. Dayton was the second of four appearances for the campaign to crisscross the entire state. Starting at Price Hill Chili on Cincinnati's west side on Tuesday morning, the Gingrichs stopped in the 'Gem City' around 2PM and departed later that afternoon for an evening engagement at Columbus' North Bank Pavilion. On Wednesday, a private meeting is scheduled with employees at the Cleveland-area corporate headquarters of Jergens Inc. Prior to leaving Dayton, the candidate and his wife, Callista, visited Hawthorne Hill, the home of the area's most honored heroes, Orville Wright, in an homage to the role that the city has played in the history and advancement of the country's aerospace defense industry. Republican presidential candidate, former House Speaker Newt Gingrich, and his wife, Callista, visit Hawthorn Hill, the home of pioneer of flight Orville Wright Tuesday, Feb. 7, 2012, in Dayton, Ohio. Photo courtesy of Evan Vucci/AP. In his opening comments, Gingrich evoked the spirit of the Wright Brothers when discussing America's demise in space exploration. Our current reliance upon other Russia to ferry US astronauts to the International Space Station due to the retirement of NASA's shuttle fleet and the recently announced initiative by the Chinese government to establish a permanent moon colony led to the candidate vocalizing his desire to establish a similar lunar site to the ridicule to his critics and fellow GOP candidates. In his defense, Gingrich said that such a program was possible and necessary, borrowing from the visionary efforts of Presidents Kennedy and Reagan to "unleash the American spirit" and to "achieve amazing things" in space, economics and national security matters. Members of Occupy Dayton made their presence felt until being asked to leave because of a 'ban' on signage. 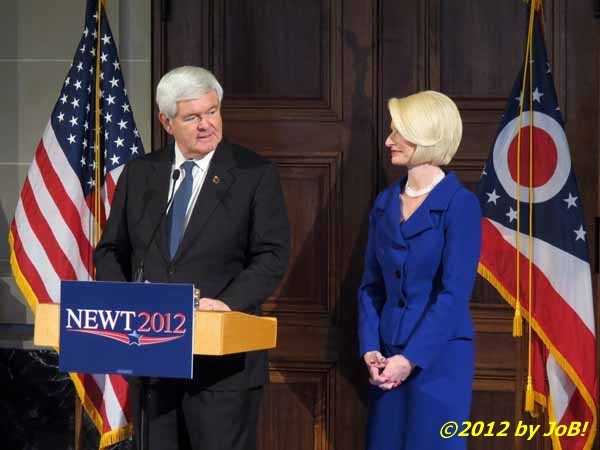 A pro-Newt sign (on the left) as well as several Fair Tax signs were also seen in the audience. Not everyone in attendance was a fan of the former Speaker. 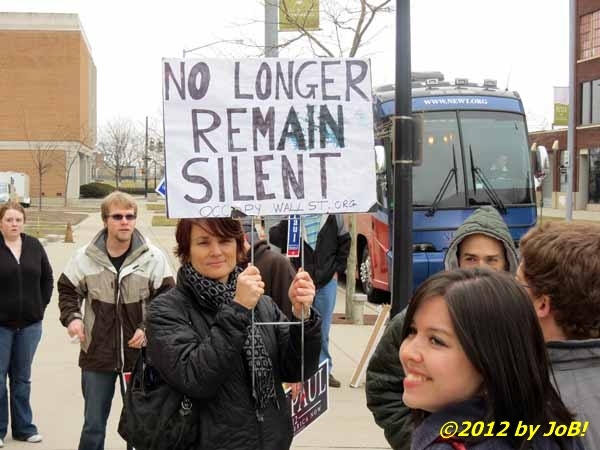 Several supporters for the rival Ron Paul campaign were seen inside the venue prior to Gingrich's arrival as well as a sign for Occupy Dayton, the local arm of the national Occupy Wall Street movement that emerged onto the national stage last fall. All were asked to leave due to a prohibition on signs and they took their message to the streets outside the venue, forming up near the Gingrich campaign bus in an attempt to make the candidate aware of their organization's continued presence and their potential influence in November's general election. 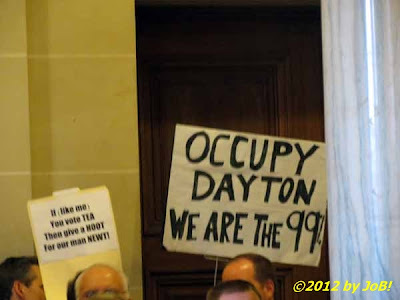 Kim Lunay, an Occupy Dayton protestor, holds a sign in support of that organization outside Memorial Hall. The Gingrich campaign bus is in the background.